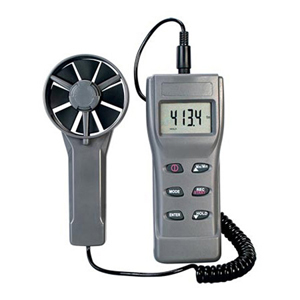 The HHF11A anemometer can measure air flow, humidity, dew point, wet bulb, air volume, and capacity. The built-in microprocessor ensures high accuracy. It can also track the maximum and minimum values along with current readings, displaying the flow rate in the user’s choice of meters per second or cubic feet per minute. With its low-friction, ball-bearing, mounted-wheel design, the HHF11A is accurate at both high and low air velocity. The impeller is accurate to 5% FS and can measure the slightest breeze (0.3 m/s). Other features include single-point averaging of air volume and capacity, °C/°F selection, and auto shut-off after 10 minutes of non-use. 참고: Comes complete with operators manual, hard case, and four AAA batteries.